features a cute little Island Style hut made of bamboo and a thatched roof, set in a secluded lagoon surrounded by tropical palm tree landscape. Your little outrigger canoe can take you back to civilization, but why would you want to go?? This is an 11x14 original palette knife oil painting. MAKAPU'U CANU'U is fun to say ! Well, leave it up to AnotherBrightIdea to come up with a fantastic treasury. I just love this one. I recognize so many fabulous Etsy artists, and it is so cool to see them all together in one place. I was lucky enough to spend the day with Felicia and her sister Fran, when they visited the Islands last month. You can read about our excursion here. We drove past Makapu'u Beach and I showed them the canoe that is parked on the shore there. I mentioned the painting of this scene that I was in the process of creating at the time. Although the canoe at the beach park is a blue and white, more modern version of the outrigger canoe, I decided to keep this one the traditional wooden style, and I am happy with the way it turned out. I named the piece "Makapu'u Canu'u" because it gives it that Hawaiian feel, and plus, I just find it fun to say!! 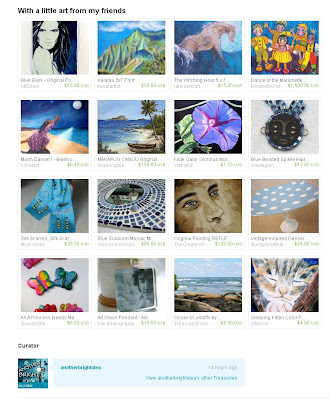 I am honored that Felicia included it in her wonderful treasury "With A Little Art From My Friends". Be sure to check out "AnotherBrightIdea's" Etsy shop. She has many beautiful photos and note cards of tropical flowers that she took while visiting the Islands. I sure hope her and her sis plan a trip back again soon! 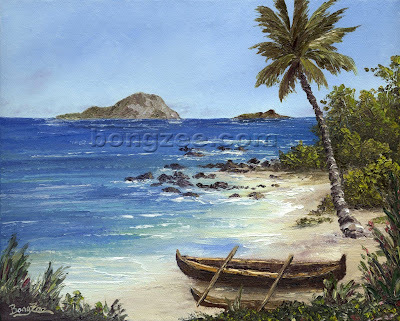 A beautiful tropical scene - the perfect place to just relax and watch your troubles drift away with the tide! 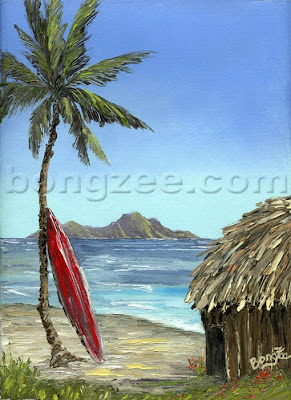 “Two Palms and an Island” is one of my original 8x10 palette knife paintings. This is one of my original palette knife oil paintings. It is titled “Ka Hale Wai” , which means “The Water House” in Hawaiian. 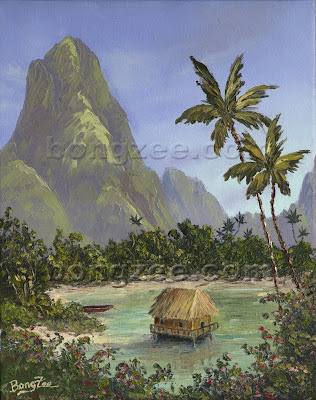 This painting features a tropical little tiki style bamboo hut built over the lagoon of a secluded island somewhere out in the vast Pacific Ocean. Lush vegetation of red ginger and palm trees, and the towering mountain backdrop make “The Water House” the perfect location to escape to!! A little tiki hut on your own tropical island. Surf all day and if the surf goes flat, you can always enjoy a cool siesta under the swaying palms. You won’t ever want to go back home! A beautiful little wooden outrigger canoe sits on the shore, waiting patiently for someone to paddle it back home, to the Islands of the South Seas. But for now, it will just sit and enjoy the breathtaking view of Makapu’u. monthly newsletter, and was surprised and honored to find out upon opening her June edition that I had been featured! Marionette (as you may know from some of my earlier blogs) is a wonderful artist on the island of Kauai. She has her very own studio, "Painting Paradise", and her monthly newsletter is always filled with exciting new things that she is up to. From painting classes and special projects to featured artists and sneak peeks at her new works of art, I always look forward to reading about life on the "Garden Isle". Marionette's (a.k.a. Kauaiartist) Etsy shop. 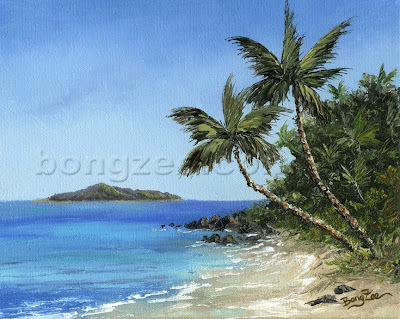 She has the most gorgeous botanical watercolors, and her scenic Kauai landscapes are just beautiful! Although I have not yet had the chance to meet Marionette in person, I feel like I know her, through sharing our Etsy Art experiences over the past few years. 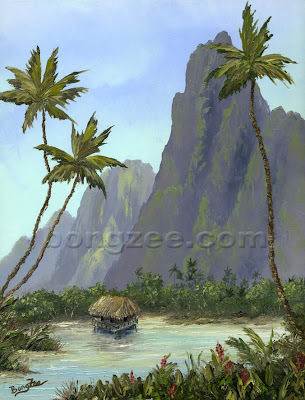 I can't wait to one day get to Kauai and visit Painting Paradise for myself! Mahalo, Marionette, for the feature in your beautiful newsletter.